This is an excerpt from a story delivered exclusively to Business Insider Intelligence IoT Briefing subscribers. To receive the full story plus other insights each morning, click here. The companies have worked together intermittently since Google launched its Google Home smart speaker in late 2016, in various attempts to offer a voice commerce package to challenge Amazon. This latest cooperative venture could offer an option that matches Amazon’s voice shopping function in the grocery space, and it could also address some of the issues preventing voice from taking a larger role in e-commerce. However, the effectiveness of Google and Walmart’s new capability will likely be limited by installed base. Here’s what it means: US consumers continue to adopt voice-based devices — Business Insider Intelligence estimates that there are around 120 million smart speakers installed so far, not to mention myriad voice-enabled smartphones — which provides companies a key platform for engagement. Both Google and Walmart compete with Amazon on various fronts, but neither boasts the combination of voice and e-commerce that the Seattle-based titan does. Google is second to Amazon in the US smart speaker market, but far exceeds the e-commerce giant in total voice assistant installed base, with over 100 million smartphones with Google Assistant in the US as well. Walmart, meanwhile, is the third-largest e-commerce retailer in the US, trailing only Amazon and eBay in volume. But neither Walmart nor Google has strength in the areas where the other excels. Now, customers looking to purchase groceries online will be able to use any of Google’s Assistant platforms to add products to a Walmart cart. One key feature is that the system will look to prior purchases to inform these new additions: A user can just say “add milk to my cart,” and Walmart’s system will add the brand and type that they typically buy. Adding items to the cart is the main functionality, rather than directly purchasing products by voice immediately after asking about them. The bigger picture: Technology companies and e-tailers are trying to foster increased consumer engagement using the voice platform for shopping, but consumers haven’t warmed to the practice as of yet. 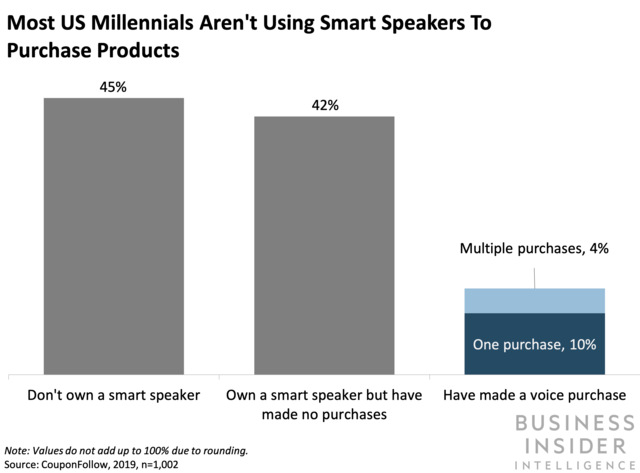 Although nearly half of millennials own dedicated voice-enabled devices, just 14% of them have made a purchase by voice, and only 4% have done so multiple times, according to CouponFollow. Emphasizing voice as a medium for product research and learning rather than direct purchasing is a useful way to boost shopping engagement, as it allows the user to add something to a shopping list while completing another task in the home or while out using their mobile Google Assistant. This approach takes advantage of the way that consumers are showing they want to use the platform. The biggest factor that could hold back Google and Walmart’s partnership is that they occupy limited portions of the smart speaker and e-commerce markets, respectively. Each trails Amazon in its segment, and their combined solution will only appeal to the consumers who use both Google’s smart speakers and Walmart’s e-commerce services regularly, which cuts down on overlap even further. Amazon’s advantage in the voice shopping space comes from its presence in both the technology and e-commerce sectors. For a company to offer a viable product that could potentially dethrone the Echo-maker, it would need to boast similar integration coupled with a significant and loyal user base, which Google and Walmart lack.